Liam Wright and Dr Christina Dunker install a sonic anemometer. Biosecurity officials receive over 10,000 reports of suspected new pests and diseases in New Zealand every year¹. Pest plants, insects and pathogens can arrive with goods and people travelling through air and sea ports near cities around the country. Managing these invaders in densely populated urban environments presents an array of challenges that will grow as urban migration continues and international movement of cargo and passengers increases. Dr Tara Strand leads a research project to reimagine the way we manage urban biosecurity incursion responses. Project researchers are developing tools and concepts that could result in faster detection of new organisms, reduced pesticide use, improved incursion responses and engagement with communities, creating a stronger biosecurity defense network for New Zealand. When any new pest is discovered, important questions biosecurity officials need answered is ‘where is it and how far has it spread?’ Gauging the distribution quickly can influence the response to the pest and early detection enables eradication treatments that prevent further spread. Dr Steve Pawson and the team, including aerial robotic company Aeronavics, are using UAVs (unmanned aerial vehicles) to detect pests earlier. Their research trials have proven the concept that a UAV wired with a pheromone sensor-antennae can detect specific pheromones from a target insect. The team is working with experts from France to miniaturise the concept and refine it. This will increase the chance of eradication; or arrive at a decision point sooner than would otherwise be the case. Once the distribution of a pest has been established the next step is to eradicate it. When it comes to insect pests, the current practice is often to treat the host plant, either by pesticide application or host removal, leaving the pest population to decline from loss of useable habitat, or by direct action of the toxicant. Dr Ecki Brockerhoff and his team have created a model that links the pattern and amount of host plants across a landscape with the population dynamics of pest species. He explains, “The model considers the distribution of host plants across the landscape and the effects on the target pest’s population, identifying how many and which host plants will need to be made unavailable to the pest species to drive it towards eradication. To put these targeted strategies into action, researchers are developing tools that deliver pesticides to a single tree at a time. 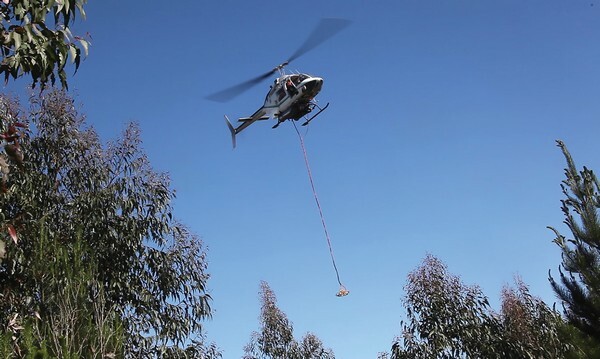 Working with the company HeliResources, Dr Brian Richardson and the team have evaluated a ring-shaped spray boom that is tethered below a helicopter and delivers pesticide to one tree at a time. A working protocol for this new tool has already been delivered to MPI and is ready for deployment. UAVs are also undergoing testing for targeted spraying. Machines tested to date are capable of delivering 10-20 litres of spray in a single load. Research efforts have focused on both the swath patterns and wake strength produced in a variety of scenarios. The work is the result of collaborations with HeliResources, Aeronavics and the US Forest Service. Tools to improve community engagement in urban biosecurity issues are also being investigated by the research team. Together with MPI and Will Allen and Associates, researchers have developed a ‘rubric’ or framework to help biosecurity managers to visualise and measure the performance of their community engagement strategies. The rubric creates a mechanism for teams to evaluate components of their engagement strategies by assessing quality of performance against a scale. As a tool, the rubric can help users to learn and share from differing perspectives, measure social and technical details, quickly identify needed improvements and is adaptable across programmes. A detailed rubric has been developed with MPI’s general surveillance team. Dr Brian Richardson inspects spray droplet dispersion on Eucalyptus leaves. 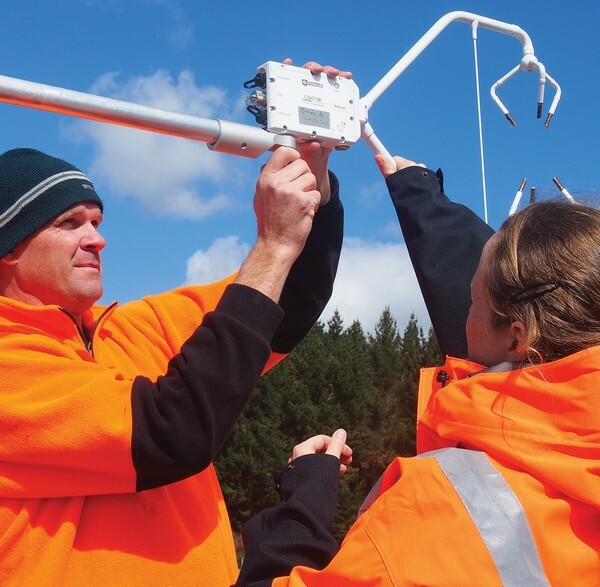 This short (3 year) research programme has contributed new tools that are ready for deployment (vegetation fragmentation modelling, ring boom spraying procedures, general surveillance rubric) and their success has earned the programme a gold rating from funding provider, MBIE. The research team credits the shared perspectives from industry bodies, Māori, regional councils and government departments for making this programme robust and relevant to the challenges of urban biosecurity, as well as the strength of national and international research collaborations helping to realise these concepts. HeliResources’ ring-shaped spray boom in action.